Dr. Nicky Keay, BA, MA (Cantab), MB BChir, MRCP is a physician and researcher with an extensive background in endocrinology and sports/exercise medicine. Her personal background as a ballet dancer and choreographer led to her long-standing interest in the effects of high-level training and inadequate nutrition on women’s health. Her current research focuses on Relative Energy Deficiency in Sport (RED-S), examining the impact of similar factors on male cyclists. In this podcast with Dr. Tommy Wood, Dr. Keay discusses the detrimental and often permanent impact of low energy availability, especially in weight-sensitive sports in which participants tend to undereat. They discuss the factors involved with RED-S, including diagnosis, intervention and prognosis, as well as the psychological factors that tend to interfere with treatment. [00:00:11] British Association of Sport and Exercise Medicine Conference (BASEM) in Doncaster. Video of presentation: Endocrine and Metabolic aspects of Sport and Exercise Medicine. 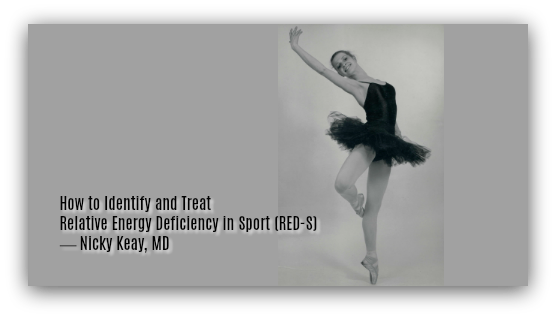 [00:02:01] Relative Energy Deficiency in Sport (RED-S). [00:03:14] Female Athlete Triad: disordered eating, amenorrhoea and low bone mineral density. [00:03:25] Bone mineral density worse with harder training; Study: Drinkwater, Barbara L., et al. "Bone mineral content of amenorrheic and eumenorrheic athletes." New England Journal of Medicine 311.5 (1984): 277-281. [00:04:11] International Olympic Committee (IOC) consensus statement on RED-S.
[00:08:50] Bone mineral density among retired dancers; Study: Keay, N., I. Fogelman, and G. Blake. "Bone mineral density in professional female dancers." British journal of sports medicine 31.2 (1997): 143-147. [00:10:00] Effect of exercise on adolescents; Study: Keay NJ, Frost M, Blake G, New S & Fogelman I (2000) Study of the factors influencing the bone mineral density in girls. Osteoporosis International 11: S1– 31; (being revised for publication). [00:11:46] Effects of sports on children. [00:19:16] Current research: amateur male cyclists. [00:28:24] Cardiovascular effects of RED-S.
[00:30:45] Diagnosing and treating RED-S.
[00:32:30] RED-S categories: green, amber, red. [00:33:38] Psychological factors: denial, resistance. [00:35:14] Exercise addiction: BMJ Article: Hausenblas, Heather A., Katherine Schreiber, and James M. Smoliga. "Addiction to exercise." BMJ: British Medical Journal (Online) 357 (2017). [00:41:46] Multidisciplinary approach; getting the coach involved. [00:44:52] Hopping increases bone density; Study: Allison, Sarah J., et al. "The Influence of High‐Impact Exercise on Cortical and Trabecular Bone Mineral Content and 3D Distribution Across the Proximal Femur in Older Men: A Randomized Controlled Unilateral Intervention." Journal of Bone and Mineral Research 30.9 (2015): 1709-1716. [00:48:31] T3 and other hormones recover first. Bone health takes longer. [00:49:50] Some evidence that full bone recovery is possible; Study: Hind, Karen. "Recovery of bone mineral density and fertility in a former amenorrheic athlete." Journal of sports science & medicine 7.3 (2008): 415. [00:50:23] Bioidentical hormone replacement therapy (HRT). [01:00:36] Publications on British Journal of Sports Medicine (BJSM); British Association of Sport and Exercise Medicine.